The Fortnite week five challenges have arrived in season seven of Battle Royale. These are the first set of new weekly challenges in 2019, continuing this snowy season. For the most part, the new challenges this week are pretty standard in comparison to the last couple of weeks. This could be because of the end of the 14 Days of Fortnite limited time event earlier this week. Regardless, there is one challenge that stands above the rest. That is the Battle Pass-exclusive challenge that tasks players with finding the hidden battle star this week on the Battle Royale map. This week’s hidden battle star is actually between some truly bizarre monuments that can make finding it difficult. The week five challenges aren’t super hard or unique, and resemble last week’s challenges quite a bit. There are once again seven new challenges for players to take on. Three of them are available to all players while the final four are only for players who have the Battle Pass. The biggest obstacle this week — search between a giant rock man, a crowned tomato, and an encircled tree — is one of those four Battle Pass-exclusive challenges. If you’re looking to take it on and reap its rewards, you’ll need to shell out 950 V-Bucks or around $ 10 in order to do so. Thankfully, the season is only halfway over so now is still a great time to jump in before the season is up. 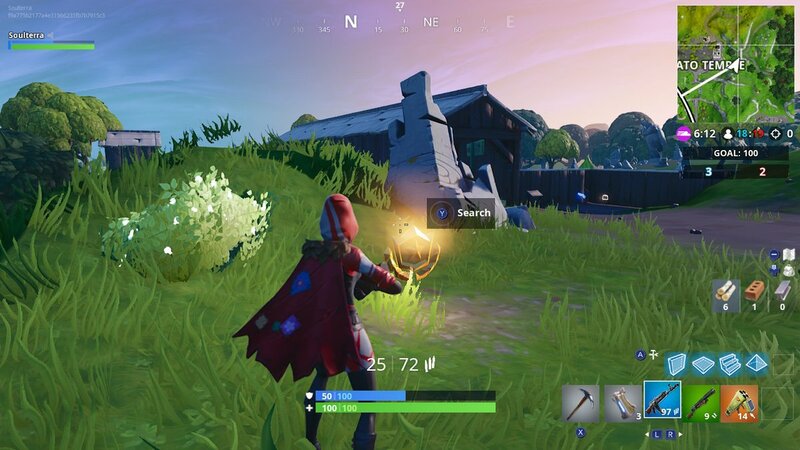 In this guide, we are going to give you our detailed walkthrough of what you need to do to find the hidden battle star this week. The title for this challenge (and our only hint for this puzzle) is to search between a giant rock man, a crowned tomato, and an encircled tree. That is certainly the most bizarre set of clues that we have received yet. We recommend that players do it in the current 50 versus 50 or big team mode. 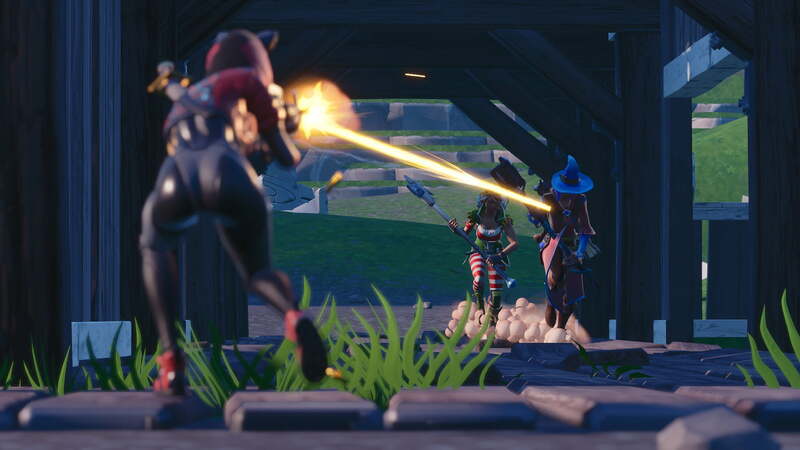 At the time of publishing this guide, the current big team mode is Team Rumble. This is a simple mode where two teams fight to see who can get 100 kills first. Because there are two large teams instead of a whole bunch of solo, duos, or squads, you have much fewer enemies to contend with. This also allows you to complete this challenge with other players on your team. You will have more people watching your back and fewer people fighting against you. In addition, there is a good bit of time to find this hidden battle star so you should be able to do it easily within the same match. Without further ado, let’s jump right in and take a look at these three strange locations. Thankfully, we don’t have to go too far to find all three spots. 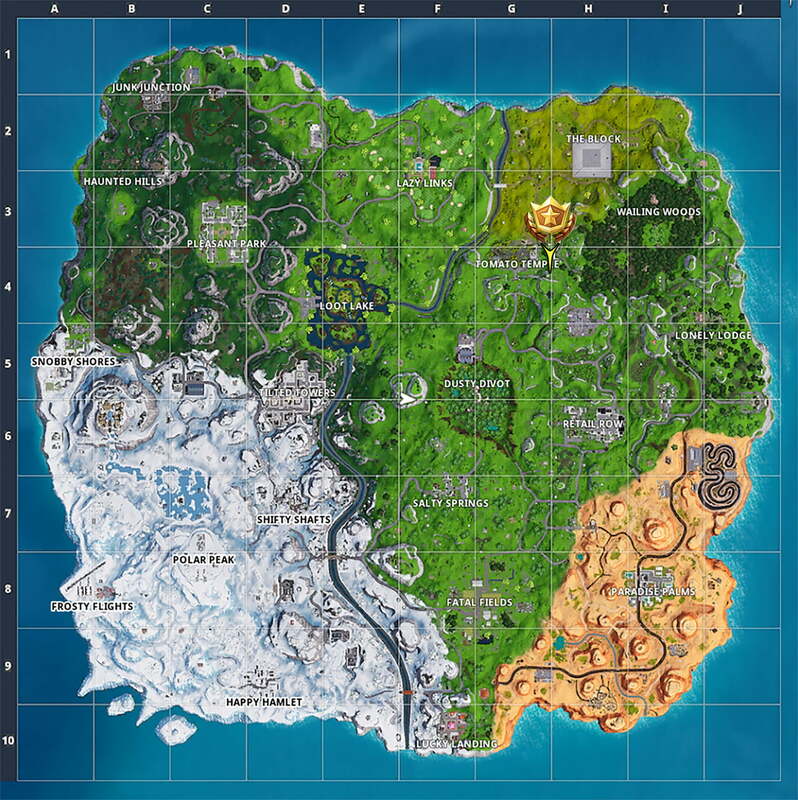 Like the ski lodges a couple of weeks ago, all three locations and their respective solution are really close to one another on the map. 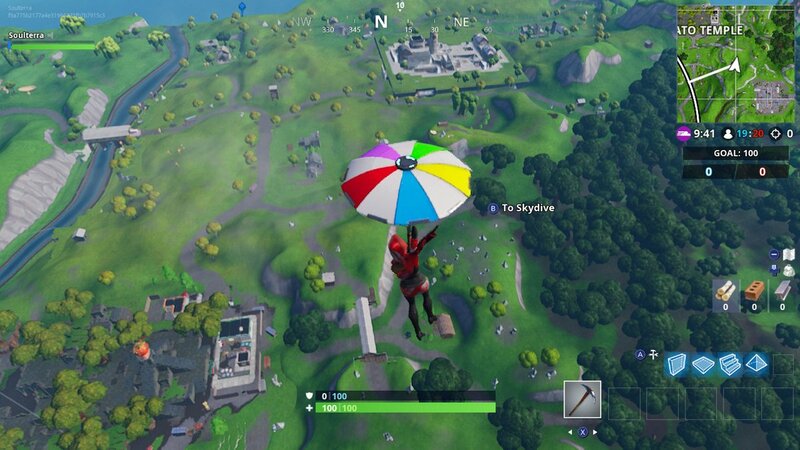 You are going to want to land near Tomato Temple for the entirety of this week five challenge. 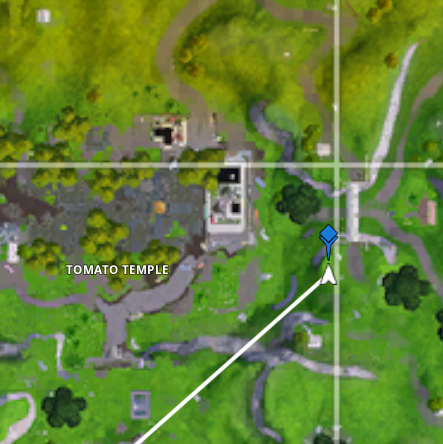 The exact location of the giant rock man mentioned in the challenge is to the east of Tomato Temple and past the bridge. It is right on the border of H3 and H4 to be exact. You will find a rock circle of sorts and near the center of this impromptu Stonehenge is a huge rock sculpture that towers over the rest of them. This one is the one that we are looking for. While it is the giant rock man, it looks more like Patrick Star from SpongeBob SquarePants hunched over a little and crying. If you happen to make it here before anyone else does, there is also a chance you will find a treasure chest beneath the giant rock starfish man. When you are done with this, we will need to head to the next spot to the west from here. The second of the three locations that we need to find is a crowned tomato. Again, this is an oddly specific and bizarre monument that we need to find. Thankfully, this is the easiest of the three and also the most obvious to locate. As you already know, we are in the Tomato Temple area. Being that there is a temple in this area, there is a tomato deity that the locals worship here. If you are heading to the second location from the first one, head west past the bridge and into the middle of Tomato Temple. You will need to locate the large temple here that is in the center of this former tomato town. Once you are in this location, it’s kind of impossible to miss the crowned tomato. 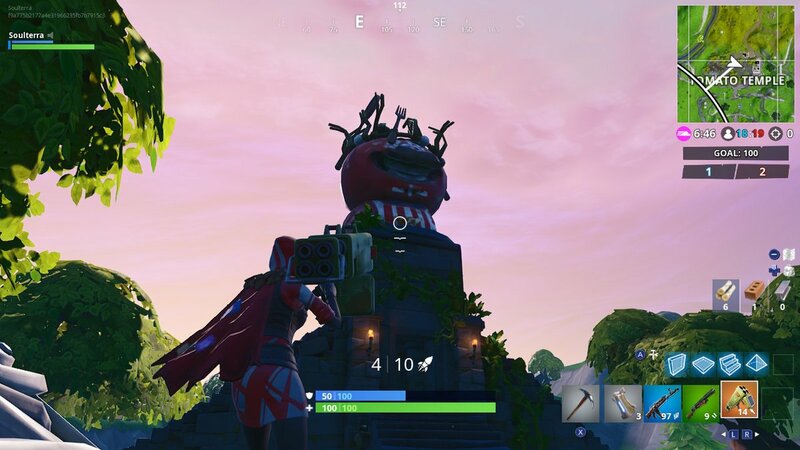 After all, the week five challenge is referring to the head tomato itself that is crowned right on top of the large temple in the center. Now, whether or not the crowned part is referring to the tomato or the sort of makeshift crown on top of the tomato’s head, is up to you. Regardless, your destination is the spot in the screenshot above. If you are still looking for loot to fight with after you complete this challenge, there is plenty laying around on the ground and inside the temple itself. With that second part of this week five challenge out of the way, we will now need to head to the third bizarre location for this challenge. Last but not least is the encircled tree location. What does this phrase mean? Well, it’s a tree that is surrounded by a circle of rocks. Thankfully, there is only one tree that fits the description nearby and it’s not too far of a walk. If you are heading from the center of Tomato Temple, you will need to head southeast of your location. 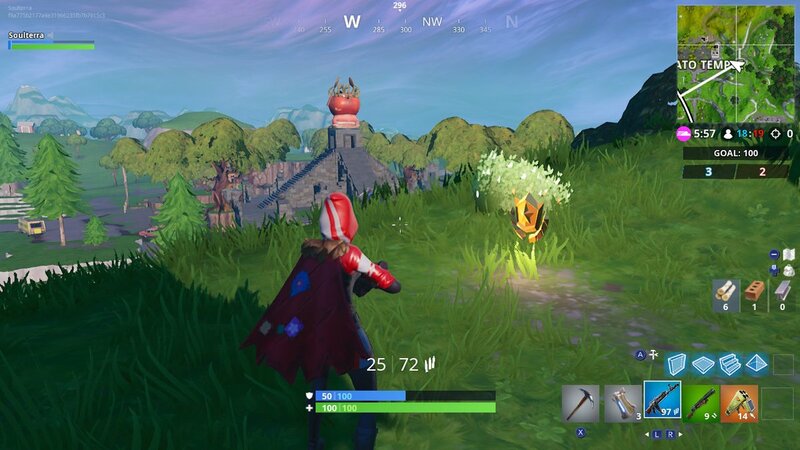 There is a little hill that is southeast of Tomato Temple and the tree we are looking for is just past it. If you’ve run into the unnamed location that is southeast of Tomato Temple then you’ve gone too far. 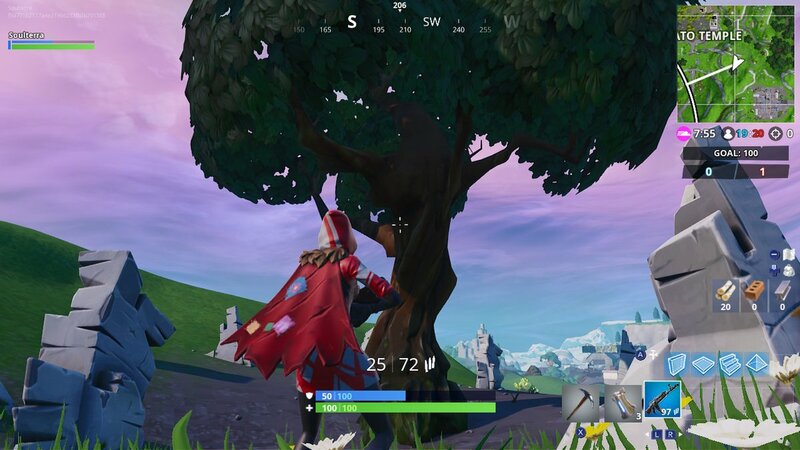 You will find this tree in between the two spots as seen in the screenshot above. It is a very large, beautiful tree that is surrounded by, once again, a bunch of rocks. This time, the rocks are spread around the tree in a perfect circle shape. Ignoring how creepy and weird this all is, you’ve now found yourself the third and final location for this challenge. Unfortunately, that doesn’t complete the challenge, though. After all, this isn’t a challenge for visiting spots but instead finding the spot in between all of them. Here is the solution to this puzzle. Let’s start by taking a look at the location of these spots that we visited. There is the giant rock man to the east, the encircled tree to the south, and the crowned tomato to the west. If you are to locate the center of all of them, you will find that it is just to the east of Tomato Temple and west of the bridge. Click here to see a where this exact spot is located on a zoomed-in version of the map. You can find the exact puzzle solution for this challenge in the screenshot above. It is directly to the left of the southern entrance of the bridge, east of Tomato Temple, and in this little clearing on the edge of a cliff. Overlooking that, you will find the hidden battle star. Remember that you must be really close in order for it to show up so you may have to move around a little. Once you find it, interact with it and you will complete this season seven, week five challenge. The reward for completing this week five challenge is simple. You found a hidden battle star so, of course, you receive some battle stars upon leaving the match. You get a total of 10 battle stars for this challenge, five more than the last time we did this, fortunately. This is enough to guarantee at least one tier level up for your character.